Do not mistake the tins of HOT and SWEET paprika in your spice rack. Having made that mistake of not really reading the labels for the hot and sweet paprika when my daughter visited once, I quite careful now! The chicken was bit spicier than usual but it was still wonderful to eat. (She doesn’t like spicy foods.) This is NOT smoked paprika in this recipe. Smoked is yet another kind of paprika. 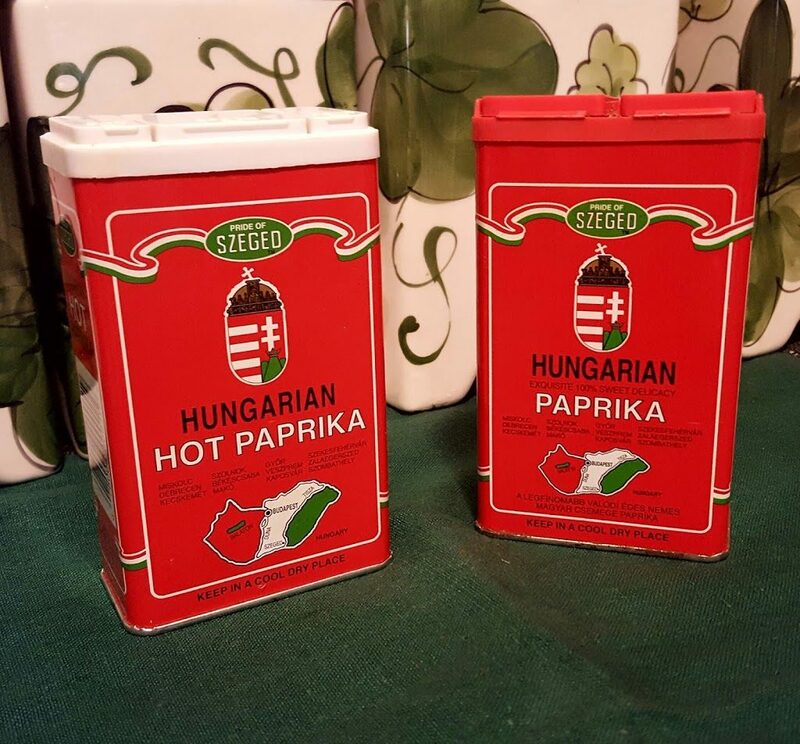 My preference is to mix of Hot and Sweet Hungarian paprika in this dish. The small amount of Hot just gives it a bit more kick. Always cook to your taste preferences! It’s your dinner, adjust it. Mom only used the sweet paprika in hers and I love it that way also. Sweet or kicked up heat this dish a full of flavor and comforting. 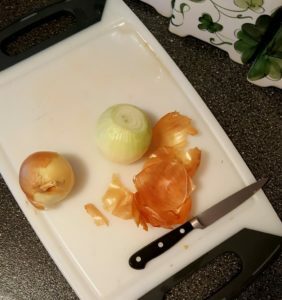 Grandmother and mom would also occasionally use some tomato sauce rather than the sour cream to finish (my brother and I always preferred sour cream!) Think she was either out of sour cream or just calorie aware. This is one of those great for entertaining dishes that can be made ahead and finished with sour cream after reheating just before serving. Great for a hearty family dinner during the week too. All stew dishes are even better the day after you make since it. 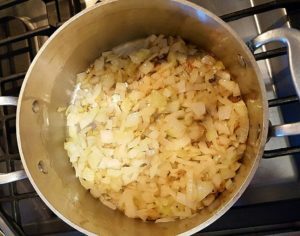 Plus if there is excess fat that cooks out of the chicken you can very easily take a spoon and defat by just scooping off that layer of congealed fat. I prefer making this ahead and removing the fat layer. Another way to remove the fat the same day is to use a fat separator measuring cup where the fat will float to the surface and the meat juices pour from underneath the fatty layer. 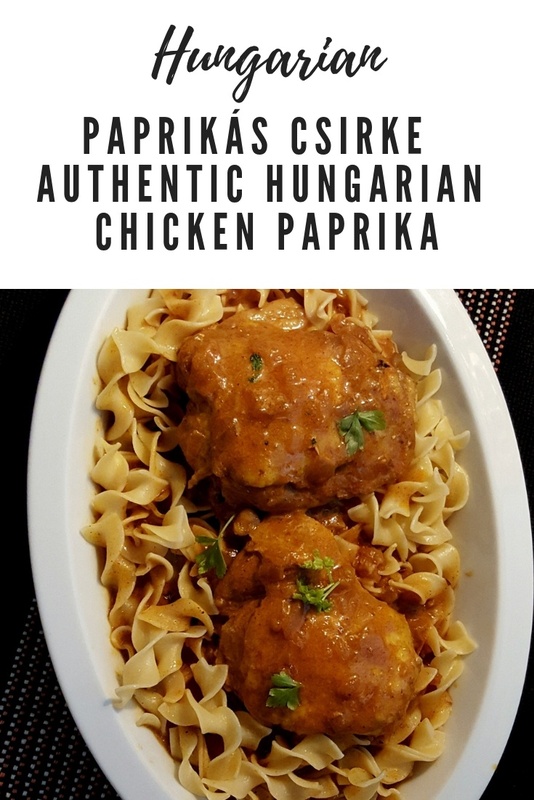 Quite a while back this recipe was first posted to a Hungarian Facebook group and even on my old blog, I was told by more than a few people it was better than their mother’s version. 1- Make sure the chicken is free of pin-feathers and trim the excess fat and set aside. Be sure to wash hands thoroughly to avoid cross-contamination in the kitchen before doing anything further. 2- Peel and chop the onions. 3- Over medium heat add oil to the pot and cook the onions until lightly browned. 4- Add the chicken, salt and paprika to the pot. 5- Some water should be added just to start the dish, but don’t add cover the chicken with liquid. The juices will increase during cooking. The addition of the water will help get the simmering off to a nice start. If you love the gravy part you’ll want plenty of it! 6- At about 30 minutes into cooking either move the pieces around to make sure they all get covered in the onion and paprika sauce, or just baste with the juices. 7- Cover and simmer on low heat for about 1 hour or until fork tender. Cooking time will depend on the size of the chicken pieces you’ve used. 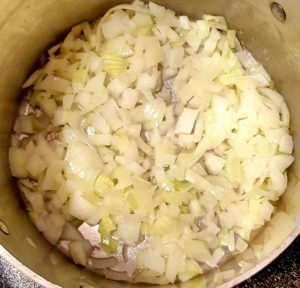 8- Adjust salt in case you need more near the end of cooking. Easier to add salt than remove salt. 9- If you like a thicker gravy use 1 Tablespoon of cornstarch whisked into the juices and cook a minute to thicken. I like this better than doing a roux (butter and flour mixture) to thicken. 10- Add the sour cream and heat to a simmer for few minutes just before serving. Have the sour cream at room temperature before adding will keep the sauce from clumping. 11- Make sure all piece of chicken are thoroughly coated with this wonderful sauce. 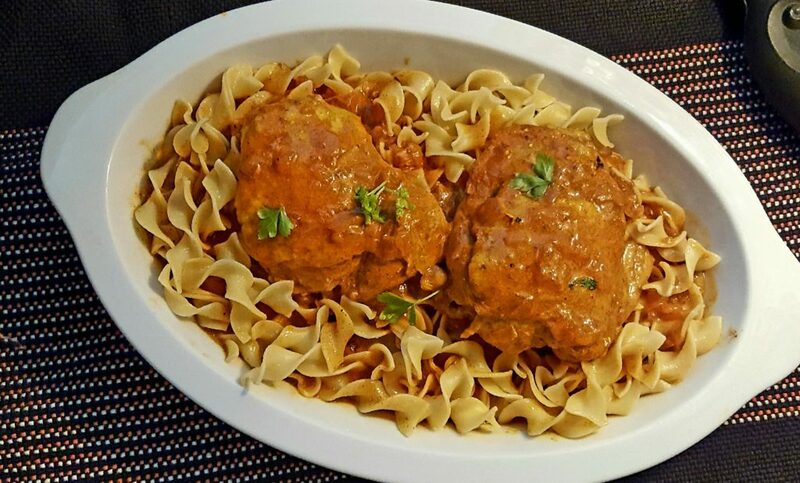 Serve over the wide egg noodles, nokedli (Hungarian dumplings) or spaetzle.